People ask what our secret ingredient is that enables us to get much better results with our organic approach. While our certified specialists have years of experience to bring to the table, there is one component of our programs that really sets us apart from our competition - that's our SafeTea. We are unique because of our blend of expertise in horticulture, soil science, and the application of our SafeTea and other soil conditioners. These restore health to the soil, increasing vigor and boosting your plant's immune system by creating an effective barrier to combat pathogens. Our products are 100% organic, not organic-based. There is a big difference. We also don’t have a one-size-fits-all approach using these fertilizers as a substitute for traditional chemical fertilizers. Our approach is to apply our professional knowledge and what we learn about your landscape to deliver personalized care to meet your unique needs. We analyze your soil to improve soil conditions so are favorable for turf or landscape plantings and able to supply the right nutrients at the right time. We put life back in the soil! 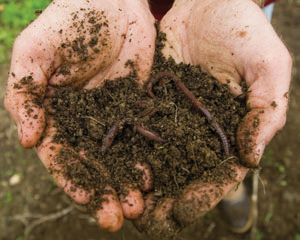 Our proprietary blends of liquid compost extract ("compost tea") contain high concentrations of the beneficial microbes that live in the soil and work synergistically with plants. Most people don't know its actually these guys that do the heavy lifting to supply nutrients from the soil in a plant available form. Landscapes and the plants growing in them vary widely. Whether lawn, trees, or shrubs, we can fine tune our recipes and program components to match the unique requirements of the plants in your landscape. We combine our knowledge of horticulture, soil science, and natural systems to bring your landscape into balance. When a soil's chemistry and biology are in balance, there's no need for harsh chemical fertilizers because the nutrients are readily available. Over time you'll find there is no need for any pesticides as healthy plants don't attract pests. They have strong immune systems to overcome common ailments affecting plants in weak soils or subject to adverse growing conditions. Our results are naturally safe for people, pets, and the planet. SafeLawns promotes soil and plant health in lawns and landscapes using advanced organic methods and naturally derived organic products. The results are beautiful lawns, trees, shrubs, and gardens that are “Safe”. Safe means free of toxins and the adverse effects associated with synthetic fertilizers and chemical pesticides. This fact gives you peace of mind knowing that your family and pets can play on the lawn anytime and that by choosing to go organic you are helping to improve the environment. For more information on the benefits of choosing organic land care, read “The Benefits of an Organic Landscape”. So why choose Garden State SafeLawns to care for your landscape? Plants and soil are interdependent dynamic living systems. For your landscape to thrive your service providers need to have training and depth of understanding how the natural system works. Without this it is not possible to support the unique requirements of the plants in the environments you choose to create; whether in our back yard, around a building, or in a public space. Our trained specialists understand these unique needs, can help you make more informed choices, and will design personalized lawn & plant care programs to achieve optimal health for the long term success of your landscape.